The AA/US Merger Is Finalized! So if you’ve been a frequent flyer of either American or US Airways, you probably just got notice that the merger between the two giants, making the largest airline in the world. But it’s only done on paper; there are going to be years before anything really substantial happens. The letter emailed out today says that the biggest change will be that US Airways will join oneworld Alliance on March 31st, 2014. I knew that was going to be the case, but it’s still good to see it in writing. Otherwise you’d have two of the three largest US airlines in the Star Alliance network – which wouldn’t be good. And finally we’re going to see a beefed up answer to Skyteam and Star Alliance with the newly formed AA/US merger and oneworld Alliance. Other than that, there shouldn’t be too many visible differences for a couple of years. It took a couple of years for TWA to be fully absorbed by American, so I foresee the same thing happening with US Airways and American. And now the real speculation begins. So there’s always been scuttlebutt about the fate of Phoenix. I think that, like Northwest’s Memphis hub, it will slowly become a focus city, with more flights funneled through DFW. Whenever I’ve talked to people who work for America West (because AW/US still haven’t integrated crews, etc, even after all these years), they’ve acknowledged that the Phoenix hub doesn’t make a lot of money. So honestly, I think there will be lesser emphasis on Phoenix, and more on DFW. That means good things for carriers like Alaska and Southwest, both of which have expanded in the Phoenix market. Speaking of Alaska Airlines, I’m wondering how this is going to affect them, especially with the way they are maintaining their ‘frenemy’ relationship with Delta. Delta is taking aim at Alaska, expanding in their primary Portland and Seattle markets, with Alaska taking aim at Salt Lake City. Right now in markets where Alaska has a smaller presence, they contract with Delta to do a lot of their groundwork (checkin, luggage handling, boarding, etc.). But say this merger with American and US Airways goes well, and Alaska – hedging their bets – keeps strategic partners with both Delta and the new American? Maybe Alaska will move gates in Dallas /Ft. Worth and Atlanta and have American do the work that Delta is doing now? And with the big expansion in SLC, I can foresee Alaska hiring their own employees in Utah instead of outsourcing to Delta; they’re going from 4 flights a day (2 incoming, 2 outgoing) all the way up to 18 flights a day (9 incoming, 9 outgoing) starting in June 2014. With that much time to prepare, and with flights coming & going from 7am to 10:45pm, I bet those will be AS employees, and not DL. Finally, are we done with merger mania? Or is there any more consolidation to come? The only thing I could possibly see myself is Alaska taking over Hawaiian – and making a commanding lead in Hawaiian flights (retiring the Hawaiian brand state-side and operating only Alaska 737s between the mainland & Hawaii), while letting a Hawaiian Air subsidiary concentrate on flights between Asia and Hawaii. And we’ve still yet to find out the fate of beleaguered Frontier Airlines; have they been sold yet? And what about once-darling jetBlue? They’d better compliment a carrier like Alaska, but if jetBlue and Frontier somehow combined, that might let Frontier bow out of the super-dominated Denver market and focus more on less hub & spoke, giving jetBlue a better route network. Or maybe even jetBlue marrying Virgin; might make getting Virgin out of the red a little easier. So here’s to US Airways and American, and hoping the merger gets off on the right foot. And I’m raising my glass to all the other speculators out there as well, who probably have their own ideas about what to expect next in the wild & crazy world of commercial passenger aviation. After yesterday, I felt I really needed to post this. I fly primarily Alaska Airlines. I think I’ve said this before, but I’ve never fully said why. My flight on Delta yesterday should give you a good reason as to why. Whenever I fly, no matter what airline, I always bring a $3 bag of Hershey’s Miniatures for the flight crew. It’s just something that I do. I have many flight attendant friends, and I know what they go through on a daily basis. Trust me, it’s not always glamorous and fun. So when I get on, say, a Alaska Airlines or Horizon Air flight, the reaction is always the same. The person I hand the chocolates gets a big smile on their face, and they ask something to the effect of, “For me? For us? Really?” And at that point, I either get a thank you or the biggest hug possible. When I was flying American Airlines every week, I usually had the same flight crews – and often I would come down the jet bridge, and would here someone on the plane get on the PA and say, “Here comes the candy man!” The flight crews on US Airways were almost as animated and thankful. So I flew on 4 Delta flights this week. Two of the times that I gave chocolate, absolutely NONE of that happened. What happened? 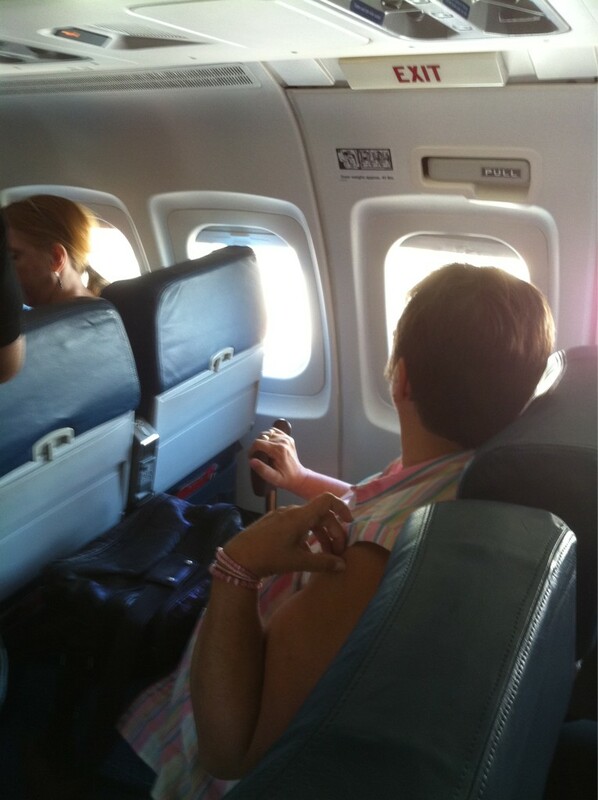 The first time, the flight attendant basically rolled their eyes and took the chocolate, then turned to throw it away. When I said that it was a treat for her and the crew, she “got it”, and said thanks. Yesterday when I was flying home, I handed the bag of chocolate to the lead FA as I was boarding the plane. What did he do? Without asking or anything, he just turned around and threw the bag in the garbage. I stood there kind of stunned for a second, then shook my head and walked to my seat. I get people who tell me I should fly Delta all the time. Why? Seriously, why should I put up with the vapidity of a flight crew that many times a week? It’s just not worth it. As my seatmate on the plane yesterday told me, “I get treated better in Coach on Alaska Airlines than I do in First Class on Delta.” And you know what? He couldn’t be more right. Bad Writing or Bad Research? Or Both? Okay, so I may be an amateur blogger/hack, but at least I try to get my basic facts right! That’s what frustrates me with some stories out there. People just don’t freaking try! And, I have a sneaking suspicion, that they’re outsourcing a bunch of these stories to people whose first language is not English. Case in point: An enstarz.com article about American Airways flight #1295. Go read that, and you count the things that are wrong… I’ll wait. Let’s see… 146 Pax in the headline? Wrong. 139 pax. The picture above the article? It’s a Boeing 737. The article about the incident itself? It’s about a McDonnell Douglas MD80. Inside the article, there’s references to both 139 pax and 7 crew (which I know is wrong), and then a little farther down it’s changed to 139 pax and 5 crew (which is correct). People on the ground reporting a problem with a plane when said plane is at 4,000 feet? I hardly think so. Not unless an engine freaking fell off or something like that! And there’s the ever present “Some say…” towards the bottom of the article, where the “reporter” mentions American’s “significant problems with engines, according to Fox News” – and then cites absolutely nothing to back up that claim. Such crap… Hell, I could do a better job! And like I said, I’m a freaking amateur hack!